Thanks for chiming in mate your feedback always appreciated. I'll mess around with your suggestions soon. I was trying to be clever where there mouth is wide open until the very point where the stalk becomes stretched, then snaps closed as if that is the mechanism it uses to trap things. I think it looks great, but he makes an excellent point about the action frame. Maybe for a single frame or two right at the max extension of the plant head, the mouth will look a bit more 'clamped', the teeth a little more exposed or something. I'm really impressed by all the other work you've done on this too. Looks like it's drawing the character nearer while on ground, too. On successful bite, you could pause the animation before the "recoil" and keep biting unless the player did some magic button smashing to get released, in which case, the plant moves back to its safer idle stance. So here's some thoughts on this. At the start I didn't really change much. Put the tile ref on a separate layer. Changed some settings to get it ready in GG. Added a couple frames of his mouth wide open for some hang time before his jaws close. Roughed in the biting frame. Put in frames to show the impact of the bite. Just a couple simple resolve frames. Also intentionally stretched out his face some to add some more action to the bite. Threw in a small particle but removed later so I could focus on working with the flower. Tweaked the first blur some. Added in the black of his mouth and teeth which are easy to visually follow. Anything that reads as multiples well, teeth, eyes, etc is good for a blur frame. Made his mouth open just a little bit wider each frame when his mouth is wide open so that there is motion and change. Changed the bite frame some to include the color of the teeth. Put a little more bounce in the bite impact. Worked on the stalk some. Tried playing with a rubber band effect when he stretches. It drew some attention away from the bite so I took it out, but interesting to try. Enlarged the teeth just before he bites down. Made the stalk simpler, added a small wave to taunt as he stretches. Decided to take out the bounce before he pulls back to simplify the overall motion. Added a couple of stretched frames to lead into the blur on the pull back. Change the shape a bit of the pull back blur and drew in teeth. These 3 are pretty much the same, just played with some particles and without. The faster the animation plays, less delays, the more range of min and max speed you have to play with. On the left is the same animation as above at 5 delays. On the right I've dropped it to 4 delays and added more speed contrast to different parts of the animation. There are parts of this I have probly not explained that well. Check out the pixels and ask questions if you need some clarity. Wow this is so smooth & pretty. The emphasis on small timings & delays is one the best advice possible for animation. Did you already made a game PixelPiledriver ? I would love to see something coming out of your hands. Did you already made a game PixelPiledriver? Well I'm paid to be a game programmer, not an artist. I just do this stuff in my spare time. Regarding the plant biting animation -- what if it opened its "mouth" during the rearing/anticipation frames? I think that would better communicate the impending danger. That's a mistake, I think. I'm very happy as a programmer. I appreciate the compliments and encouragement but my purpose here is to benefit the success of Decroded, not my own. My post could be more detailed from frame to frame. But at the moment I have too many other things to do. Perhaps what I should do next time is draw notes on each frame. The main point is emphasize the time and space in different parts of the animation. Space is controlled by distance and change in shape. Time is controlled by frames and speed. There is also some overlap between them but that is the basic concept. Of course variations are needed to find the desired result. My edit is just one way to weight the frames. Try some other stuff and see what happens. This look awesome! Great work! 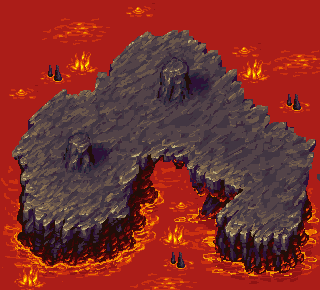 some ideas for lava cave.